I was driving in the car the other day and realized just how many blind spots I have. I try and angle all of my mirrors to help reflect some of them, but they are still there. Inevitably, I still have to turn my head whenever changing lanes. Like a car, we all have blind spots. Some we see. Some we use coping mechanisms to help reflect those spots, but some we don’t. We all like to think that we have our spots under control. We also like to think that our spots are known only to us. Also like a car, passengers like to point out spots we don’t see. 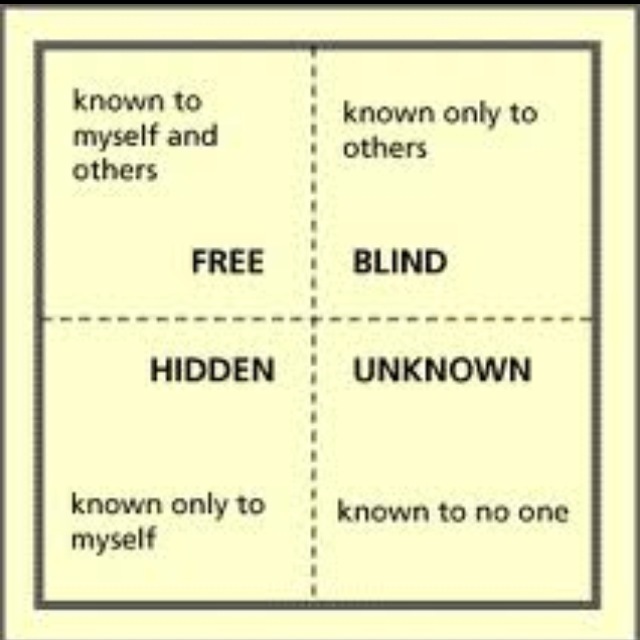 When I studied communication and counseling, we often looked at a graph called Johari’s window. This is a four square graph that illustrates our known and unknown areas. 4) We also have things that are unknown to both us and to others. I will be the first to admit that I hate not having a handle on all of my stuff. I hate when others see something (i.e. a fault, defense mechanism, response pattern, habit, or quirks) that I am unaware of. The deeper reason is that I am uncomfortable being out of control. I am always fascinated by how we handle each other’s spots. Not everyone is open to hearing what other’s see in them. We are not always open to dealing with the spots we are aware of. How we communicate what we see and hear matters. How I respond in conversation and situations is a glimpse for someone else to see into my spots. We are constantly communicating, both verbally and nonverbally, to each other what is going on in our hearts. These are all things known and unknown. How are you handling the glimpses you get of another’s heart? What do you do with the spots you see and hear in someone else? What are you doing with those things only known to you? Are you approachable when it comes to someone point out your unknown spots? As much as we like to think we know everything about our own hearts, we don’t. I love that God created us to be a part of community for that reason. Community is one tool used to help us become the best version of ourselves we can be. How we communicate and love one another within this window matters. Johari’s window applies to everyone. I just want to encourage you to take a look at what your window looks like, as well as how you are handling the window’s of other people. Everyone responds, acts, and tells the stories they are for a reason. Listen and catch a glimpse of the heart. We are a culture that operates out of created groups. We learn how to “belong” through gravitating towards like-minded people. Every high school has the same social groups now as they did 15 years ago when I was there. We called our like-minded group of friends our community, but in reality they were cliques. Cliques do not allow room for community. I watch these girls and laugh because my friends now are so different. My closest friends are made up of a mismatch group of gifts, personalities, fears, looks, and passions. One of my closest friends and I joke all the time that we would not have been friends in high school. Our groups and judgments would not have let that happen. Community ceases to be community when it becomes a clique. There is no room for community in a cliques. Cliques are closed to anyone new joining in. Cliques enforce a hierarchy of judgment someone needs to pass in order to be allowed in. It makes me sad when I see adult cliques in the church. Clique mentality has no room in the community of the church body. We are all made in his image. We are all invited to walk a life journey with the same God. Some would say that the 12 disciples were a clique. No one else was allowed to be a disciple. But look at the mixed match up of those guys! The community of disciples consisted of different personalities, passions, interests, looks, temperaments, gifts, strong wills, extroverts, introverts, popular, and the loathed. There was no reason these guys should’ve been doing life together – they didn’t go together. They didn’t make sense. But isn’t this true community? Community is made up of all of those who are trying to do life well, and follow after the invitation to do life with Him. Community takes a chance on people. Community sees and wants the heart. Community is inviting. What are your thoughts on community? What makes community for you? It was the best of times, and the…..
Maybe you have heard it said, “don’t try this at home.” Well, I’m here to tell you that the saying is a true story. I spent this past week owning Nashville with my BF Alece. We had a great mix of serious and play. I am always so grateful for time I get with her. There are friends who are there to laugh at your impulsive choices, and then there are those who say, “Wait! Let me get the video ready!” Alece is one of those friends! This is one way to sum up our week together…. Have you ever had an experience where you were expecting one thing and something completely different happened? I can clearly remember one of these times when I was a senior in high school. It was a long time ago, but memories last. It was a friend of mine’s birthday. We were in a small group together and shared some of the same group of friends. Some of our friends had made plans to hang out at her house to celebrate her birthday. I picked up another friend and we headed over to her house. What happened next was like a weird movie. My friend and I parked across the street and with mouths dropped, headed over to the house. This was no small party. My fellow classmates filled the rooms wall to wall. Alcohol was flowing from every corner. There were people falling out of the front door, unable to stand. Music was blaring and the birthday girl was passed out on the couch. My heart sunk as I thought what was meant to be a celebration turned into cleaning up vomit and protecting my friend. The Police were eventually called and the mad dash out of the back door ensued. I entered in the front door to celebrate my friend and left helping “friends” hop fences and race down alleys. That is one picture that comes to mind when I read about Jesus clearing the temple courts. Jesus, and his friends and family, were expecting to see a temple filled with prayer. What if Jesus was excited to show his friends one place where his father was still being celebrated, acknowledged, and communicated with? The temple was the one place His father had his rightful throne. Or did he? Jesus approached the temple expecting holiness and what he found was a marketplace. The people of Jerusalem had cheapened the temple of the holy God. They took what was holy and sold it for what was profitable. The temple of God was now being associated with money exchanges, trading, bartering, and sales. Jesus’ heart sunk. Out of heartache, Jesus desperately fought for what the temple was meant to be. I look at my heart and can name a number of tables I have set up in his temple. I have bartered in the name of being known. I have cheapened this temple from what he made me to be. I have set up tables of fear and hid. I have traded his place of holiness for instant gratification. I have consumed myself with a marketplace thinking that was serving him. I’m gonna take a risk and say the most tricky place I see a temple gone market is with social media. So here are some questions to ask yourself about your temple. Do you twitter for relationships or marketing? How are your motives for being known? What do people associate with you? Do people read your blog and want him or you? I have had to work through these questions, and more, for my own heart. I want to be a temple consumed by him and not a marketplace. Sometimes you just need a place to pray and talk to God. My model for talking to God is from John 17. I would love for this to be a place where you can talk freely to God. if you want to listen to the prayers and thoughts of others, please do. Here is my heart. Pray with me. Father, I sit at your feet today blessed with the chance for a break from “normal” life. Thank you for your grace that leaves me quiet. I am learning the reality of not taking your forgiveness and grace lightly. Forgive me that I have treated those values flippantly. I dismiss you too much in my life. I am trying to sit in my emptiness and exhaustion to leave space for your peace. I know that my self-sufficiency has enabled my exhaustion. Forgive me for leaving you out of my life too much. I am so quick to think I can handle this life on my own. But father, I don’t want the life that I can manage. I want to experience a life where I have to depend on your logic and ways. I want to be bold enough to look foolish to this world and culture. My heart has an ache of a dream that seems to be of you. I ask that you would lead me I your way of understanding so that I can move toward your dream for me. Fears affect my steps as well as my faith too much. I hate that. I am sorry for the one step forward and the two steps back of trust. Thank you for your patience. Thank you for your gentleness with my heart. Thank you that you love me and take on my debt every day. Help me not to take that lightly. Be with me on this vacation and lead my smile and laughter. Father, be with my friends who desire you as well. Be with my friends who are also exhausted and need your larger than life presence. Strengthen the bruised reeds of their heart. Love on my friends so deeply. Grow our friendship together in a way that shows your face and your character. Help us to learn how to lay our selfish wants and desires down. Help us to place the other person above ourselves. Please help us to always move towards healthy goodness in you. Please help us to know how to celebrate one another more and more as our friendships grow more intimate. We desire intimacy with you. I pray that we would find that in you first. I pray that we would pursue you first for the sake of a right friendship. Father, thank you for how I know you more because of my friends. I am so grateful for the ones I know face to face and the ones I know by heart. I am so grateful for the richness of these great friends. They are yours. Help me to keep them that way. Help me to love friends with open hands to you. Thank you for friendship. Thank you for the chance to experience life with my great friends. I praise you for that. And father I pray for all those who need your peace today. I pray for the hearts that are struggling to find your voice and presence. Be father in a real way to those who know you, as well as, those who are curious about you. Provide places of comfort for those who need it. Provide wisdom for those who are seeking understanding. Provide your name for those who are in need of your power. You know all hearts. You know all things. I pray for those who are tired and slow to bounce back. Provide your place of rest. This culture needs your name. This culture is desperately seeking something of value and power. You are the one who is good. You are the one hope for life in this world. Apart from you, we are nothing. I pray that you would remind this culture of your desire for us. You desperately want intimacy with your children. Rise up community and real authentic people to provide your voice and name. Not just this culture, but all cultures known and unknown. You are known, and claim all by name. I hope for change. It’s in your illogical name I pray these thoughts and words. Amen. When I think about what healthy relationships look like, I always think about David and Jonathan. These two guys are often in the spotlight for how well they loved each other, as well as, how they modeled friendship. When I read about their friendship, I see some serious fruit. Relationships have weeds that can threaten its growth, but it also has great fruit. One characteristic about their friendship that I am constantly drawn to is their selflessness in regards to one another. Let me give a little back story on how they cultivated this friendship. At the time when David and Jonathan began their Bro-mance, Jonathan’s father, Saul was residing as king. David had been anointed by Samuel to be the next king due to Saul’s disobedience to the Lord. Naturally, Jonathan should have been in line for the throne. It was no secret to Jonathan that David was the one to take the throne. Jonathan did not fight for the throne. He never tried to force himself on the throne or over turn what God had set in place. Jonathan loved and supported David as the one who would be taking over his birth right. I don’t know about you, but my natural response would not have been love and respect. I would have gone down swinging. Dang weed! Even if Jonathan felt jealous or envious of the throne, he did not respond that way. He celebrated his friend and brother. When David was moving more and more into the lime light as a great leader and warrior, Jonathan never responded in bitterness. He loved his friend and celebrated his victories. He also celebrated David as people praised him and cheered for his growing fame. I wonder if Jonathan wanted a taste of that lime light? At the time when David and Saul’s relationship grew more volatile, Jonathan stuck by his friend. Jonathan was a man of integrity. David trusted him with his life and the intimacy of his friendship. They modeled an honest relationship that I’m sure came with much forgiveness. A great relationship allows/enables each person to be their total self. A healthy relationship allows the other person to rest in acceptance and unconditional love. Good relationships allows for grace and forgiveness. As a result of grace and forgiveness, a sense of safety takes root. This is when the sound of exhale starts to be heard within the relationships. So how did David and Jonathan have a healthy friendship? In my speculation, I think they both understood God’s love and forgiveness for themselves. David had such an intimate relationship with God. I know that had to have made a difference in their friendship. The characteristics of their great friendship are the characteristics that make up the character of God. God is loving, forgiving, grace filled, and patient. He is slow to anger and abounding in love. God is the God of integrity. He is trustworthy. He celebrates his children and never settles for anything less than the best. I have to believe that our understanding of who God is can set the tone of our weed filled or fruit filled relationships. How we know who God is directly affects our relationships. All good things come from above. This is my desire for all my relationships.